Your air conditioner is a topic which rarely comes up, until it breaks, at which point it becomes the most important thing on your list, especially if you live in Georgia. Since the heat in this state can reach unbearable temperatures, the HVAC industry is slammed with work each summer. Because of this, prices are higher, and the wait times are longer. 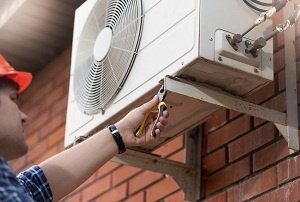 If your AC is broken, then you have no choice but to call a Roswell air conditioning repair pro, but if everything seems to work fine, you should make sure it stays that way by paying attention to your AC unit. While some signs are a clear red flag, like hot air coming from your AC, others are harder to spot. One example is squeaking which may start to come from your HVAC system. A lot of things squeak, which is why some people choose to ignore this, but what they’re really doing is setting themselves up for disaster. Squeaking is usually the result of poor lubrication, or in other words, an issue with oil. If you let your HVAC system run with old oil, or low oil levels, it will lead to wear and tear of individual components, which results in eventual breakdown and may need complete replacement. If you’re lucky, it could just be a slipped belt, and a quick maintenance visit from an air conditioning service in Roswell, GA, should fix the issue, but in either case, don’t wait around for things to get worse. Another big issue which your AC unit may develop is leaks, which don’t sound too bad, but could result in serious problems. If you’re dealing with an older HVAC system, you may be using a refrigerant which will no longer be legal to produce in the near future, such as R-22. The prices on R-22 are soaring because the gas itself will be made illegal in 2020. If you’re leaking refrigerant, just the cost of replacing the lost freon could be significant, and that’s not including repair fees. 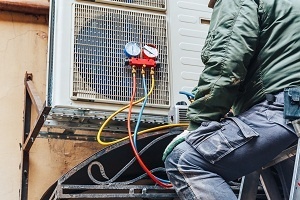 If you’re dealing with poor air flow, this is another sign that you need to perform maintenance on your AC unit, but it’s not nearly as serious as a refrigerant leak or oil issues. A simple filter change may be all you need to fix the issue. However, this doesn’t mean you should ignore the problem, since most major repair jobs begin with small issues. Another problem you may encounter due to lack of maintenance is odor. If you notice a funky smell coming from your HVAC system, it may be because of bacterial build up. While this won’t stop your AC unit from working for some time, it could be a danger to your health. Calling up a Roswell air conditioning repair pro is not something most people plan on doing this summer, but if you’re overdue for maintenance, then waiting is not recommended.